Cj's Instructional Systems Design Blog: What Is Instructional System Design? What Is Instructional System Design? Welcome. This is the inaugural post for this blog. I wanted to point out that information about the blog and me (the author) are available on the tabs just under the header. 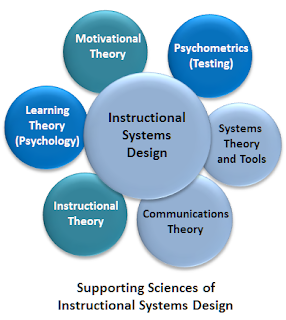 An old presenter’s adage says, “When in doubt, spell it out.” So just to establish a baseline for this blog, I will discuss what Instructional Systems Design (ISD) is and the major theory basis that support ISD. Cj’s definition, Instructional Systems Design is a process that combines the elements from various sciences to aid in creating an experience aimed at helping humans learn. You can find a lot of other definitions like at Wikipedia, but I’m bringing you mine in from the 10,000 ft. level (read big picture). Please take a moment and reflect about all the different activities and components of designing and implementing an instructional event. Now, brainstorm lists of the various science areas (theory basis) that collaborate during the process. Systems theory supplies the interrelationships of a process; a combination of parts forming a complex or unitary whole. Communications theory shows us how to impart our thoughts, opinions, or information by audio, video, text and/or visuals. Learning theory explains the process of how humans learn providing the basis for instructional theory. Instructional theory uses the theories of learning and describes how to construct an environment that is conducive to learning. Motivational theory gives us direction on how to tap our emotional energy; so learning becomes desirable. And, psychometrics supplies the methods of testing which provides us with a metric to judge our success. What’s a Trainer to Do? There are countless models, techniques, and strategies associated with each supporting area. Why? Because none of them work all the time under the variety of possible things we can learn and the conditions we may learn under. One could take a single science area and spend a lifetime or a career mastering all of its nuances. To our benefit, there are some general guidelines for application. So, here is our challenge, to learn enough about all of them in order to be eclectic enough to make reasoned decisions about what we create to help others learn; the main focus of this blog. You can read A Brief History of Instructional Design by Douglas Leigh. Your comments, candid and kind, will be appreciated and the next blog posting might depend on the answer to the poll question. Please take time to answer it.